This past May Day was the first alignment of great weather and time off I've had in Montreal for 2015. 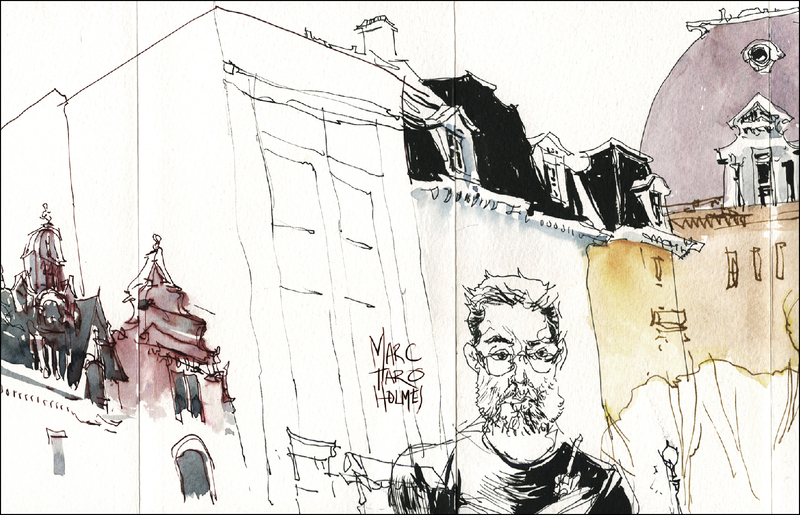 I met up with a couple of friends from USK, and spent the afternoon sketching in the Plateau. I was playing around with an accordion folding book, (sometimes called a Japanese sketchbook). The one I have is from the gift bag from USK Barcelona - (been on the shelf for a while!) It's a 5x8.5" format book with accordion folded paper, forming a long 'continuous' ribbon of paper. (It's not really a single piece. There are some glued seams in the paper - but you don't really notice them and they seem sturdily made). My goal was to try to make a really big panorama drawing, going the entire length of the book. I started my first sketch early and made it just over halfway before I had to relocate to meet the others. 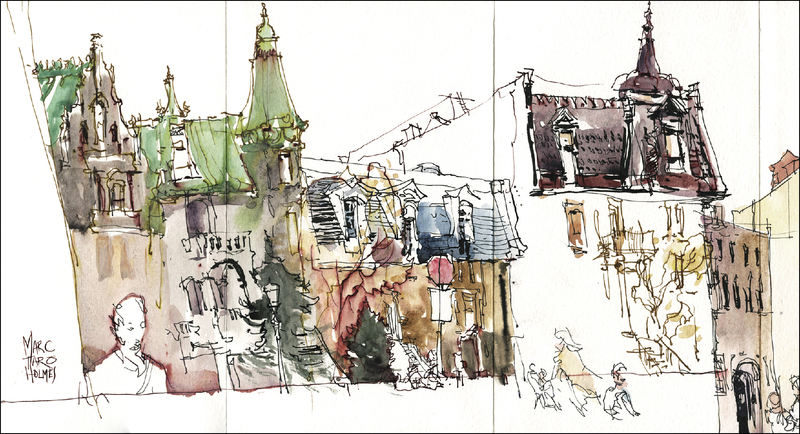 This first drawing was done by moving down Sherbrooke street and adding buildings as I moved west. I'm purposely not worrying about a 'correct' point of view. Each 'block' of buildings is in its own perspective and scale - but it adds up to a kind of floating view that zooms in on whatever interesting bits there are to see. 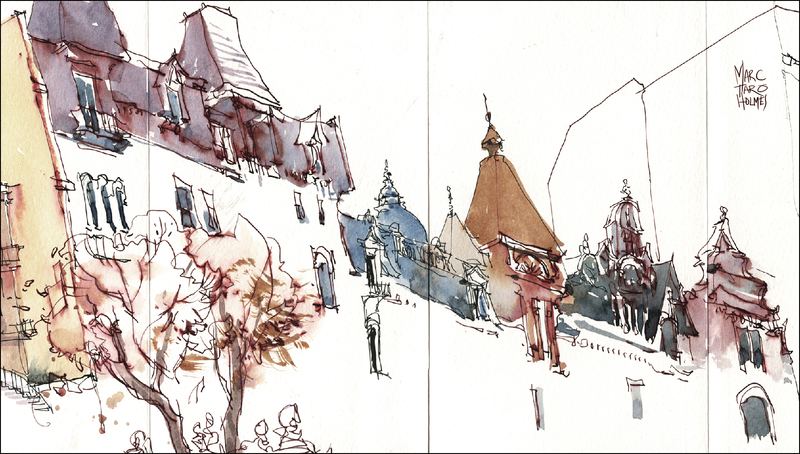 The second half of the book is drawn in Square Saint Louis. We were sitting in the middle of the park, so it was natural to stay in one place and wrap a 180 degree arc of view around the fountain centrepiece. Well, it's meant to be in the center, but I sort of ran out of book. So half the arc is a little squished - but hey, this was just for fun so I'm not complaining. The real goal for this day was to just be out in the sun, having fun drawing. No bothersome perspective, no measuring for accuracy, no particular care with color. I was sort of challenging myself to see if I could make it to the end of the book - I like to have a little game, or goal post for each day. Turned out not to be that hard at all. There are only 11 spreads in this book (+ endpapers).